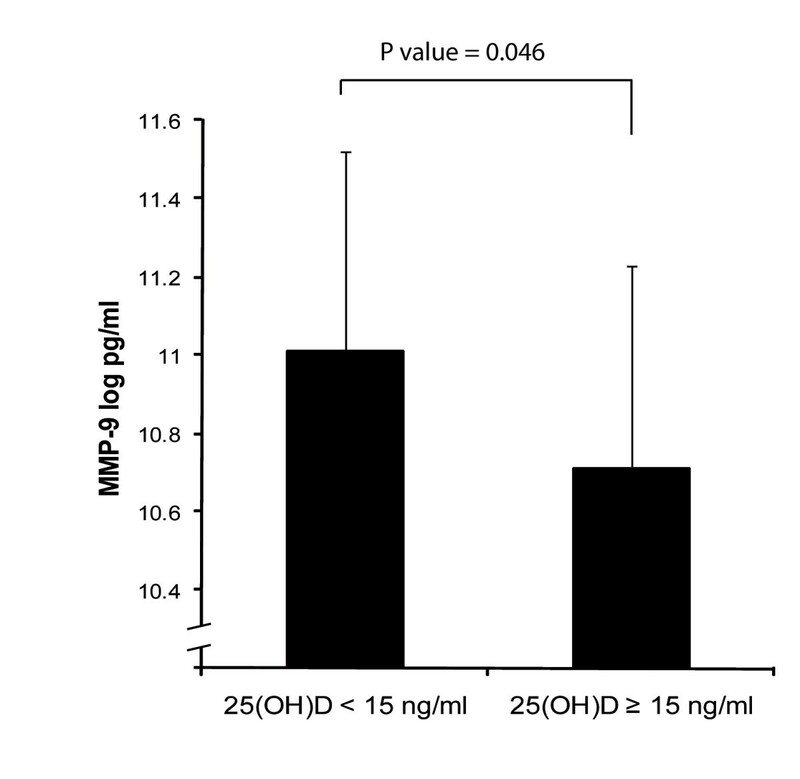 Circulating 25-hydroxyvitamin D [25(OH)D] concentration is inversely associated with peripheral arterial disease and hypertension. Vascular remodeling may play a role in this association, however, data relating vitamin D level to specific remodeling biomarkers among ESRD patients is sparse. We tested whether 25(OH)D concentration is associated with markers of vascular remodeling and inflammation in African American ESRD patients. We conducted a cross-sectional study among ESRD patients receiving maintenance hemodialysis within Emory University-affiliated outpatient hemodialysis units. Demographic, clinical and dialysis treatment data were collected via direct patient interview and review of patients records at the time of enrollment, and each patient gave blood samples. Associations between 25(OH)D and biomarker concentrations were estimated in univariate analyses using Pearson's correlation coefficients and in multivariate analyses using linear regression models. 25(OH) D concentration was entered in multivariate linear regression models as a continuous variable and binary variable (<15 ng/ml and ≥15 ng/ml). Adjusted estimate concentrations of biomarkers were compared between 25(OH) D groups using analysis of variance (ANOVA). Finally, results were stratified by vascular access type. Among 91 patients, mean (standard deviation) 25(OH)D concentration was 18.8 (9.6) ng/ml, and was low (<15 ng/ml) in 43% of patients. In univariate analyses, low 25(OH) D was associated with lower serum calcium, higher serum phosphorus, and higher LDL concentrations. 25(OH) D concentration was inversely correlated with MMP-9 concentration (r = -0.29, p = 0.004). In multivariate analyses, MMP-9 concentration remained negatively associated with 25(OH) D concentration (P = 0.03) and anti-inflammatory IL-10 concentration positively correlated with 25(OH) D concentration (P = 0.04). Plasma MMP-9 and circulating 25(OH) D concentrations are significantly and inversely associated among ESRD patients. This finding may suggest a potential mechanism by which low circulating 25(OH) D functions as a cardiovascular risk factor. The chronic pro-inflammatory state of end-stage renal disease (ESRD) is associated with increased risk for cardiovascular disease and death [1–3]. 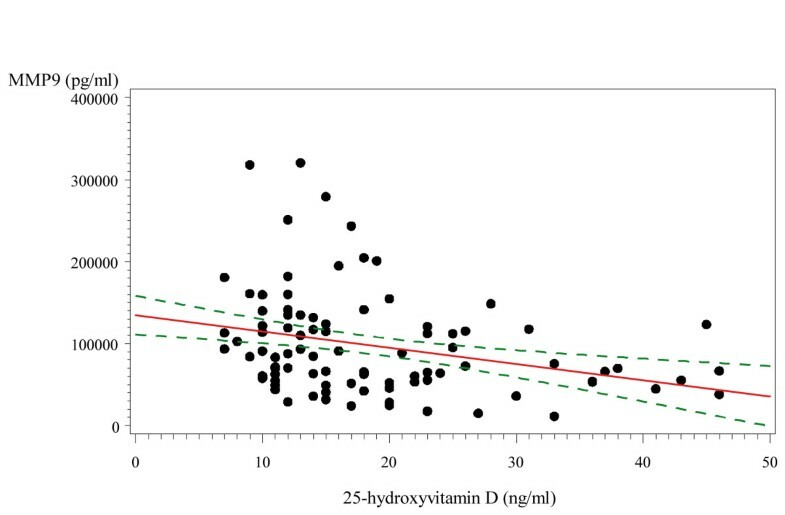 Observational studies suggest an inverse association between circulating 25-hydroxyvitamin D [25(OH) D] concentration and serum inflammatory biomarkers. Low 25(OH)D concentrations are associated with elevated tumor necrosis factor-alpha (TNF-α) concentrations , and randomized controlled studies among critically ill patients and those with congestive heart failure report that vitamin D supplementation leads to significant reductions in interleukin 6 ( IL-6) and C-reactive protein (CRP) concentrations , and resulted in lower tumor necrosis factor-alpha (TNF-α) and increased anti-inflammatory IL-10 concentrations . However, few studies have addressed the association between 25(OH)D concentration and increased inflammation on biomarkers of vascular remodeling. Matrix metalloproteinases (MMP's) are important in extracellular matrix remodeling, are major effector molecules of inflammatory cells, and play a key role in many vascular diseases, including hypertension and aneurysm formation [7, 8]. Recent in vitro studies indicate that vitamin D down-regulates MMP-9 production by TNF-α  and suppresses production of MMP-7 and MMP-9 [10–12]. Moreover, MMP-2 and MMP-9 activation are associated with collagen deposition and cardiac fibrosis . Previous studies document the high prevalence of 25(OH) D deficiency within the U.S. ESRD and general population [14, 15], and the association of 25(OH)D deficiency with vascular disorders [16, 17]. Therefore, examination of the relationship between circulating 25(OH)D and biomarkers of vascular remodeling is warranted, as identification of a link between 25(OH) D concentration and vessel remodeling may suggest a mechanism for vitamin D deficiency as a risk factor for cardiovascular disease, and with further study, may offer promising therapy to improve vascular function among chronic kidney disease and ESRD patients. We sought to determine whether circulating 25(OH) D concentration is associated with serum markers of vascular remodeling and inflammation in a cross-sectional study of prevalent hemodialysis African American patients. Adult ESRD patients receiving in-center maintenance hemodialysis at one of six Emory University-affiliated Davita dialysis centers between September 2006-November 2008, were eligible to enroll in the study. The majority of patients within the Emory dialysis centers are African American; of 94 patients enrolled, 91 were AA, thus we limited our analyses to AA patients. Patients were excluded from the study for the following reasons: 1) presence of known malignancy or active vasculitis; 2) evidence of current infection or inflammation; or 3) current or recent use of steroids, calcineurin inhibitors or antimetabolite medications (methotrexate, azathioprine, 5-fluorouracil, mercaptopurine, sulfadiazine). These exclusion criteria were chosen because they provide inflammatory or anti-inflammatory therapy that could alter the association between vitamin D and inflammatory markers. Demographic, clinical and dialysis treatment data were collected via direct patient interview and review of patients records at the time of enrollment, and each patient gave baseline blood samples. The Institutional Review Board (IRB) of Emory University Medical Center approved the study protocol and informed consent was obtained from each patient prior to study enrollment. Human subjects procedures followed were in accordance with the ethical standards of the institutional IRB and with the Helsinki Declaration of 1975. All assessments were conducted at a single baseline visit. We analyzed several covariates including age, gender, self-reported race, length of time on dialysis, body mass index (BMI), smoking status (never, former current), vascular access type (arteriovenous fistula, arteriovenous graft, central venous catheter), season of blood collection, and activated vitamin D treatment. Comorbidities included diabetes (defined by use of diabetes medications), hypertension, stroke or transient ischemic event, congestive heart failure, peripheral arterial disease (PAD), and HIV or AIDS. Results of calcium, phosphorus, intact PTH, albumin, hemoglobin, KT/V (used to quantify hemodialysis adequacy), total cholesterol, LDL and HDL cholesterol, and triglycerides obtained within two weeks of the baseline blood sample measurement were abstracted from the outpatient dialysis records and included in the analysis. All patients received hemodialysis treatment three times per week. Blood for the analysis of serum biomarkers was drawn specifically for this study protocol, and was obtained before a routine, midweek hemodialysis session within 5 days of study enrollment. After collection, serum and plasma were aliquoted and stored at -80 C for subsequent analysis. All assays were performed on plasma as directed by the manufacturer and samples were centrifuged for 10 minutes at 10000rpm before testing. All the assays had quality controls, plasma controls and a non-plasma sample that was added to each plate. The dilution of the samples (always done with the Calibration diluent in which the Standard Cocktail was reconstituted ) depended on the individual assays and of the expected concentration range for the samples tested. The Fluorokine® MultiAnalyte Profiling (MAP) Kits from R&D Systems (Minneapolis, USA) were used to determine the concentration of analytes. The Fluorokine® MAP MultiAnalyte Profiling Human MMP Base Kit (R&D Systems) was used to determine the matrix metalloproteinase 9 (MMP-9) and MMP-2 concentrations (the inter-assay variability is 3.0% and 6.2% respectively). Il-6 and Il-10 concentrations were measured with the Fluorokine® MAP MultiAnalyte Profiling Human Base Kit A (R&D Systems) (the inter-assay variability is 4.6% and 5.2% respectively). The CardioPhase hsCRP reagents from Siemens Diagnostics (Dade Behring product) were used to determine the concentration of hsCRP in plasma samples on a BNII (nephelometry systems) System. The Internal Quality Controls (Controls SL/1 and SL/2 - lower-higher range of CRP) and Standard SL curve were run with the assay. Serum 25(OH) D concentrations were measured using chemiluminescence immunoassay (Diasorin Inc, Stillwater, MD, USA; coefficient of variation over multiple runs 6.3-12.9%) by ARUP Laboratories (Salt Lake City, UT). 25(OH) D concentration was categorized using a cutoff of 15 ng/ml, the point below which there is an increased risk for cardiovascular events [18, 19]. Categorical variables were reported by using the number or percent of observations. Continuous variables were expressed as means with standard deviations. For comparative evaluations, Chi-square tests (Fisher's exact test when appropriate) and student unpaired independent t tests were performed for categorical and continuous variables, respectively. Distribution figures and Kolmogorov-Smirnov tests were used to assess inflammatory marker normality. Non-normally distributed markers were successfully normalized by natural logarithmic transformation. We used figures plots to verify that relationships, if any, between biomarkers and 25(OH)D concentrations were linear. Associations between 25(OH)D and biomarker concentrations were first estimated in univariate analyses using Pearson's correlation coefficients and corresponding P values. To adjust for possible confounding of these associations we then used multivariate linear regression models. Included in the models were previously reported confounders as well as variables significant at the 5% level from the univariate analyses. 25(OH) D concentration was first entered in multivariate linear regression models as a continuous variable. Adjusted associations between continuous vitamin D concentration and biomarkers were reported as beta regression coefficients where the null value (β = 0) represented no association. We then categorized 25(OH) D using a binary variable (<15 ng/ml and ≥15 ng/ml). Adjusted estimate concentrations of biomarkers were compared between 25(OH) D groups using analysis of variance (ANOVA) with SAS generalized linear model procedures. Finally, results were stratified by vascular access type. Two-tailed P values P < 0.05 were considered statistically significant. All analyses were performed using SAS version 9.2 (SAS Institute, Cary, NC, USA). The characteristics of the entire study cohort and of those classified by serum 25(OH) D concentrations are summarized in Table 1. Lower 25(OH) D concentration was significantly associated with lower serum calcium, higher serum phosphorus, and higher LDL concentration. There were no significant differences in other characteristics between vitamin D status groups. Among the study cohort, all subjects were treated with activated (D3) vitamin D, with the exception of 17 subjects, who took no form of vitamin D (activated or nutritional), and 3 subjects who took only nutritional (D2) vitamin D. The characteristics of the cohort by vascular access type are summarized in Table 2. Vascular access type was significantly associated with diabetes, stroke or TIA, HIV or AIDS, 25(OH)D and hemoglobin concentrations. Mean 25(OH) D concentration was 18.8 ± 9.6 ng/ml. Thirty-nine (42.9%) subjects had a 25(OH) D concentration <15 ng/ml (Table 1). The mean serum 25(OH) D concentration of subjects in the higher (≥15 ng/ml) and lower (<15 ng/ml) vitamin D category were 24.5 ± 9.0 ng/ml and 11.1 ± 1.9 ng/ml, respectively. 25(OH) D concentration was inversely and significantly correlated with MMP-9 concentration (r = -0.29, p = 0.004) (Figure 1), while the remaining biomarkers were not associated with 25(OH) D by correlation (Pearson) analysis. The distribution of serum inflammatory markers by 25(OH) D concentration are shown in Table 3. In the univariate analyses and compared to patients with 25(OH)D ≥15 ng/ml, MMP-9 and CRP concentrations were significantly greater among subjects with 25(OH)D < 15 ng/ml. The remaining inflammatory markers were not associated with 25(OH)D categories. We compared the difference in MMP-9 concentration between the lowest and highest 25(OH) D groups (Figure 2). Compared to the highest group and after adjustment for smoking, gender, BMI, age, diabetes, season and activated vitamin D treatment, the log MMP-9 concentration was greater in the lowest 25(OH)D group (P = 0.046). For every unit increase in 25(OH) D concentration, there was a log decrease in pro-inflammatory MMP-9 concentration of 0.018 pg/ml (p = 0.03), while there was a log increase in anti-inflammatory IL-10 concentration of 0.02 pg/ml (p = 0.04) (Table 4). Upon stratification of vascular access type (arteriovenous fistula (AVF) vs. arteriovenous graft (AVG)), it appears that the association between 25(OH) D concentration and MMP-9 was mostly driven by AVG's, as 25(OH)D and MMP-9 and IL-10 no longer remained associated among AVF users. In contr ast, for every unit increase in 25(OH) D concentration, the log concentration of MMP-9 decreased by 0.052 pg/ml (P = 0.002) among patients using an AVG, while the association of IL-10 to 25(OH) D no longer remained significant among AVG users (Table 5). Our results indicate that plasma MMP-9 expression is inversely and independently associated with circulating 25(OH) D concentration among ESRD patients. We also found anti-inflammatory IL-10 concentration to be associated with 25(OH) D concentration. This is the first report to our knowledge to assess the relationship of 25(OH)D concentration with MMP-9 and IL-10 in an ESRD population, and may help to shed light on mechanisms by which vitamin D deficiency is associated with an increased risk of atherosclerosis and cardiovascular disease. Our results are consistent with previous data among non-ESRD populations that report a strong association between 25(OH) D deficiency and elevated markers of vascular remodeling: Vitamin D supplementation of vitamin D deficient, healthy British Bangladeshi adults resulted in significant reductions in plasma MMP-9 and serum CRP concentrations . Vitamin D supplementation of congestive heart failure patients significantly increased serum concentrations of anti-inflammatory cytokine IL-10 and suppressed TNF-α synthesis over a nine month period . Further, previous reports show that anti-inflammatory IL-10 is increased by vitamin D supplementation in vitro and in mice . Vitamin D acts on dendritic cells, T-cells, and B-cells to enhance IL-10 expression [21–23]. While others have reported reductions in CRP concentrations following vitamin D supplementation [5, 6, 24], and negative correlations between serum 25(OH)D concentration and TNF-α concentrations , this was not observed in our study, possibly due to our sample size or that a greater differential in 25(OH)D concentration may be needed in order to observe an association with these biomarkers. Whilst we identified associations between both MMP-9 and IL-10 with 25(OH) D concentration, we also observed several important negative findings in this cross-sectional study following multivariate adjustment. First, while PTH concentrations were greater among patients with 25(OH)D < 15 ng/dL, they were not significantly different among the vitamin D cohorts, as we would have expected to observe, possibly due to our relatively small sample size. Second, there was no significant association observed between 25(OH) D and CRP, the most common biomarker of inflammation. This may be due to our relatively small sample size, however, other cross-sectional reports among non-ESRD populations have also failed to find an association between 25(OH)D concentration and CRP concentration following multivariate analysis, supporting our conclusion [4, 14, 18]. We did not observe elevations in MMP-9 and CRP concentrations as large as those reported previously in comparable patients , likely because MMP-9 gene expression is upregulated by several factors that were not included in our analysis. Finally, while MMP-2 concentrations tended to be higher with 25(OH)D concentrations <15 ng/dL, this did not reach significance, likely due to our sample size. MMP's promote the remodeling of connective tissue and basement membranes via degradation of collagen, and act as important regulatory molecules in inflammation and vascular diseases. MMP-9 is released by neutrophils and is a key effector molecule of inflammatory cells, aiding migration of inflammatory leukocytes through tissue barriers, lysing protein substrates, modulating smooth muscle cell migration, and promoting angiogenesis [26, 27]. MMP's also regulate inflammation by directly and indirectly acting on pro-inflammatory cytokines, such as TNF-α and TGF-β, to control chemokine activity . 25(OH)D may act to reduce MMP-9 in several ways. An increase in IL-10 concentration, as we observed, may also act to suppress MMP-9 secretion . Pulmonary tuberculosis in vitro studies suggest that vitamin D blunts MMP-9 expression by inhibition of c-Jun-N-terminal kinase(JNK) and NFkappaB signaling cascades . MMP-9 concentrations are increased in the setting of several chronic inflammatory diseases, and MMP elevations are associated with abdominal aortic aneurysm rupture  and acute myocardial infarction . These findings suggest that the risk for acquiring or further progression of these disorders may be positively impacted by limiting MMP concentrations. Another important finding of our study is that vascular access type modifies the relationship between plasma MMP-9 and circulating 25(OH) D concentrations. When we stratified AVF versus AVG, the association between MMP-9 and 25(OH) D concentrations no longer remained significant among AVF patients, whereas the relationship remained significant among patients using an AVG, suggesting that MMP-9 concentrations in AVF patients were too low for a relationship with 25(OH)D to be detected. This may occur because the prosthetic material within an AVG may induce increased systemic inflammation. This finding is supported by data examining the role of vascular access type on systemic inflammation among prevalent HD patients, which noted that CRP concentrations were significantly lower among autogenous AVF users compared with patients using a prosthetic AVG . Limitations of this study should be considered. First, our relatively small sample size may affect our results, however the 25(OH) D concentrations observed among our subjects are comparable to those reported among larger ESRD patient cohorts, and the observed inverse association between 25(OH) D and MMP-9 has been reported in a larger, non-renal patient cohort . Second, the cross-sectional design of our study does not allow for causal inference. We cannot exclude the possibility that an association exists between 25(OH) D and the additional inflammatory biomarkers examined in our study, but due to our relatively small sample size, we may be underpowered to detect it. For example, the power to detect a statistical difference, if any, between 25(OH)D groups was less than 50% for TNF-α and MMP-2. Third, although we have attempted to reduce the effect of confounding by limiting our study population to include only patients free of infection or inflammation, residual confounding inherent to the cross-sectional design cannot be excluded. In conclusion, the results of our study reveal a new finding of a significant inverse relationship between plasma MMP-9 and circulating 25(OH) D concentrations among AA ESRD patients, and suggest that there may be value in measuring 25(OH) D concentrations in ESRD patients. In addition, we observed a positive association between 25(OH)D concentration and anti-inflammatory IL-10 concentration. Our findings extend data obtained from previous studies in linking low vitamin 25(OH)D concentrations to elevated concentrations of the cardiovascular risk marker, circulating MMP-9, in ESRD patients. Given the high prevalence of nutritional vitamin D deficiency and cardiovascular disease among ESRD patients, our findings suggest that future studies are warranted which further characterize the relationship between nutritional vitamin D therapy and vascular remodeling biomarker synthesis. This study was supported by an NIH K23 Grant DK65634 (H.W. ), a Davita Clinical Research Grant (H.W. ), and a PHS Grant (UL1 RR02008, KL2 RR025009 or TL1 RR025010) from the Clinical and Translational Science Award program, National Institutes of Health, National Center for Research Resources. Additional support (I.G.) was provided by a grant from the Swiss Foundation for Science (33CM30-124087).